Happy Kitchen Sink Stamps Monday, thanks for stopping by, I hope you had a great weekend! 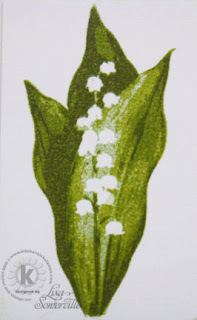 Stepping away from my Holiday cards again, to share another card created with the Multi Step Lily of the Valley that's available in the Limited Edition Year of Thanks II Tin. 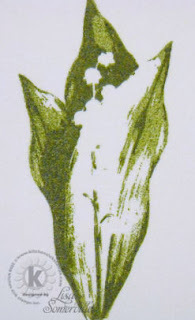 I love using the Kitchen Sink Stamps Multi Step Images they have such great depth and detail and look just like photos. A lot of times I get comments left on my KSS posts telling me they liked my coloring. I think that's the biggest thing stampers don't understand about these images, I'm not actually coloring them, I'm adding color with inks using Multi Step Stamping. Let me show you what I mean. I'm stamping my images in reverse order, stamping darkest to lightest. I didn't take a photo of #5 (sorry), it was stamped in Stampin' Up! Always Artichoke. Next step, stamp #4 in Stampin' Up! Old Olive. See how the images line up when stamped. Next stamp #3 in Stampin' Up! Kiwi Kiss. Notice the Lily area is still White. When you place your inked stamp over the stamped image, you'll see exactly how the next stamped layer will fit. Next stamp #2 using Stampin' Up! Certainly Celery. 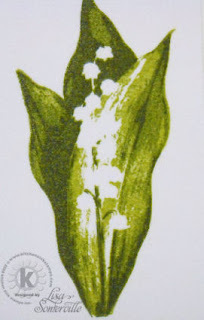 Notice how more of the White space is filled in, leaving just the Lily. 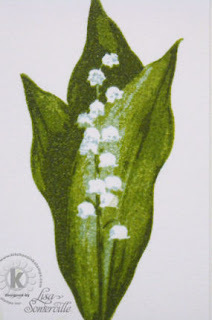 The final step adds the shading the to image and the Lily. Stamp #1 in Stampin' Up! Soft Sky. This particular color recipe can be found here. Maria has put together a ton of great color recipe resources using many Kitchen Sink Plates, along with various stamp companies inks, be sure to check them out, I'm sure you'll find them very useful. The stamped panel is layered on a Chocolate Chip panel, where I used the Torn Edges Technique. The sentiment comes from the Kitchen Sink Stamps set 3 Step Hibiscus. Don't forget you can save 10% on all your purchases at Kitchen Sink Stamps, just use code LISA10KSS when ordering. Be sure to grab your KSS stamps and play along with this months challenge - you might just win some great Kitchen Sink Stamps prizes! Lisa, you make these stamps just come alive. Love your work with them. I am so loving this beautiful new KSS flower! What a gorgeous card you have created with it here. Lisa!! I love the step by step photos!! Thanks for including them!! Such a fabulous creation Lisa. I love the DP you used and the step-by-step illustrations definitely make it easy to see how everything flows together. Beautifully done! Beautiful, Lisa!! Such a wonderful technique! I often stamp theimages backwards too...sooo much easier to line up that way! Love the bit of soft blue you added too...stunning!! Thanks for the great tut, you know I'll use it, beautiful card! Beautifully done, Lisa!! You did a wonderful job on showing the steps - explained a lot about the beauty of KSS Multi Step!! 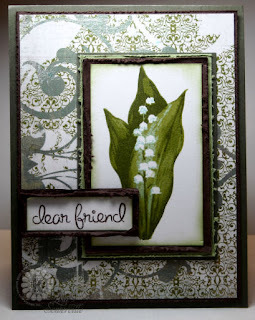 Lisa I love the look of this card with the lily of the valley stamps. But how cool that you also provided the tutorial. Wonderful! Thanks for the tips! I was just playing with my KSS stamps today...too bad I didn't check my fav blog first.